This picture was recently acquired by the Bone Creek Museum of Agrarian Art in David City, Nebraska. We appreciate Mark Moseman, the curator, taking the time to contact us about it. It appears that this painting is derived from sketches that Peter Helck made in August 1947 at the Scofield Farm down the road from his studio and home in Millerton, NY. 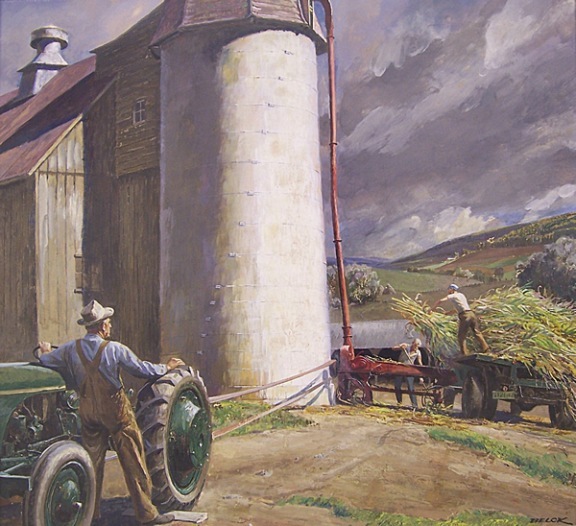 A very similar painting appeared on the cover of Country Gentleman magazine in September 1950 (see below).